If you Google that, you’ll get an infinite number of answers. There have been hundreds of articles written by parents stating what not to say to those with a disability. Raising a child in a wheelchair doesn’t make me an expert on all people in wheelchairs. It isn’t always about someone’s words. It’s about their heart. Oh, to be quick-witted and still gentle like my eldest. Allison, my youngest, was born with a rare genetic birth defect. 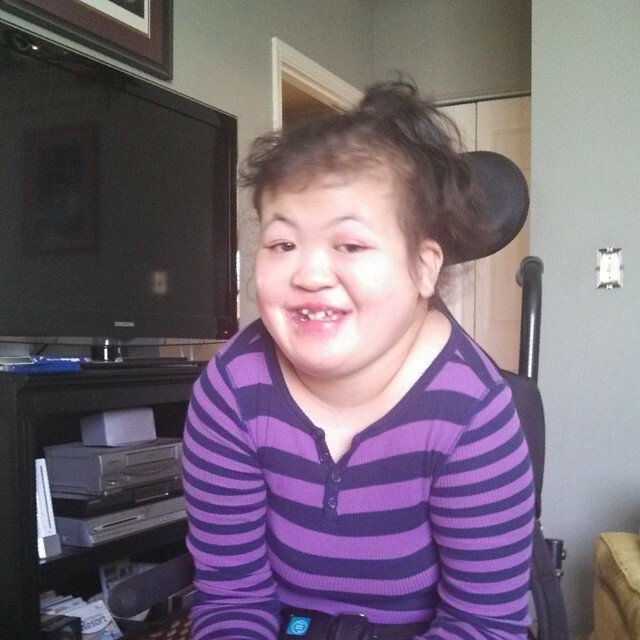 Her medical condition is rare, her issues complex and her development unpredictable. Raising her has daily challenges. Very often when we are out, a question or comment is made by a stranger. It’s not what is in the words that offend or endear as much as the reasoning behind the inquiry. Sometimes, it becomes a teachable moment. Sometimes, it’s just… a moment. Friday night, we chose to spend some time at the mall. Just the three of us, checking out the clearance sales and just getting out of the house. We stopped at the shoe store because our girl likes cute shoes. While checking out the sizes, the store clerk approached us and asked if we needed to measure our daughter for sizes. She spoke directly to Allison, asking her name, telling her what she would be doing and engaging her directly. Not once did she ask, “What is wrong with her?” or “What is the name of her disability?” She didn’t flinch at the bubble beard being made by the drool on Alli’s chin. She not only helped us find shoes, she didn’t make us feel odd. You see, it isn’t always about someone’s words. Often, parents want to teach their children to be kind-hearted. We want the next generation to see the beauty in others, so we take those opportunities to find out. The problem is, we spend more time talking about differences than we do about things we have in common. We see something different, so we engage there. How often do we pick our friends that way? Watch children on a playground. They interact with those who enjoy the same things. Their friends usually have most of the same interests. They don’t spend hours talking about their distinctions or asking personal questions. It isn’t that they don’t share those things. They just don’t focus on them. We could learn so much from them. Although my daughter can’t participate in dancing, she adores watching others tap their toes and twirl to music. She loves pretty clothes, cute shoes and watching movies. Her dog, Maximus, makes her laugh while he runs around her favorite chair in the family room. When you meet someone in public who is distinctly different, don’t focus on what isn’t like you. Whether it be ability, race or size of family, we are all made in the image of our Creator. Rather than seeking the answer to a question, look for a way to encourage through a smile or friendly hello. If you aren’t sure what to talk about, the weather is always a safe place to start.